Louis Marquel Roe was born July 14, 1972 in Atlantic City. Lou was raised by his mother, Madeleine, who worked as a hospital dietician. He gravitated toward football as a boy and distinguished himself as a relentless and tireless player. The basketball coach at his middle school asked him to play for the team one night. He put his aggressiveness and size to work under the boards and was named the MVP of the game. Suddenly his focus was on basketball. Lou learned some of the game’s finer points from his cousin, Bobby Martin, who starred for Pitt. He followed in his cousin’s footsteps and became the star of coach Joe Fussner’s Atlantic City High Vikings. Lou was skinny when he joined the varsity, but worked out with the football players and became a monster by his junior year. A right shoulder injury sustained playing football forced him to shoot and rebound left-handed—which made him especially valuable around the rim. Lou averaged 26.2 points as a senior, and was named New Jersey’s High School Player of the Year. At 6’7” and just over 200 pounds, Lou was an appealing recruit. He accepted a scholarship from the University of Massachusetts, becoming John Calipari’s first blue chip signing.. After one season as a sub, Lou was a starter for his final three years at UMass. He was good for 15 points and 10 rebounds most nights. He ranked in the Top 10 in rebounding in the Atlantic 10 Conference all four years, and also made the All-Tournament team four times. As a senior in 1994–95, he was a Second-Team All-American and A-10 Player of the Year. That season he scored a career-best 34 points against Arkansas, the defending national champions. 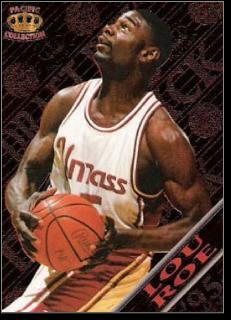 Lou finished his UMass career as the school’s third-best all-time scorer and all-time rebounding leader. Lou was the first player taken in the second round of the 1995 NBA Draft. He was selected by the Los Angeles Clippers and immediately traded to the Pistons for veteran James Edwards. He got into 49 games and logged about 5 to 10 minutes a game. He also saw action in two playoff contest. Lou’s best game was a 14-point 9-rebound night against the Orlando Magic in November 1995. Lou wasn’t quite big enough to bang with the power forwards, and not quite quick enough to be a small forward. The Pistons released him over the summer and he caught on briefly with the Golden State Warriors in 1996–97. Lou decided to take his game to Spain in 1997–98. He played for Unicaja Malaga and then returned to the U.S. to play CBA ball with the Rockford Lightning. He averaged about 20 points a game and helped the Lightning reach the playoffs.